If UFC 169 was a loser-leaves-town match between Alistair Overeem (pictured) and Frank Mir, then it looks like Mir’s 12-year UFC career came to an end on Saturday night. Both heavyweights entered the shootout needing to collect a win – Mir had dropped three straight, while Overeem was riding a two-fight skid. 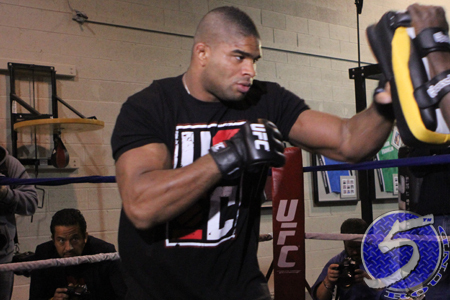 Overeem was less Ubereem than usual, shedding some mass in favor of better cardio. Mir, meanwhile, proved he still can take a shot. Most were surprised he survived a vicious knee in the opening round. At the end of the day, Overeem left New Jersey with a lopsided unanimous decision victory. UFC 169 took place inside Prudential Center in Newark.